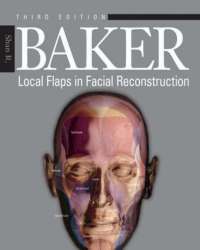 Local Flaps in Facial Reconstruction brings you the detailed visual guidance and unmatched expertise you need to achieve the best results for the full range of facial flap procedures. Full-color clinical photographs and line drawings―along with high-quality surgical video clips―capture the latest facial reconstruction practices and effective methods like reconstruction of skin defects on the head and neck following tumor removal or trauma. Perspectives from facial plastic surgeons, dermatologists, ophthalmologists, and otolaryngologists help you take all of these considerations into account in treatment planning. Understand skin flap anatomy and physiology―vital to the performance of successful local flap reconstruction for facial defects.